Of course I'll have the full slides on-line after the conference but if you're coming to Defcon please come to my talk: Friday, August 8th at 2pm. What exactly will I be talking about? Well, it's really difficult to describe succinctly but the best way I can say it is: An XSS inside your company == Total Domain Ownage. Was that a scoff I just heard under your breath? Honestly, I'm not lying here. Because of the way NTLM and Windows Single Sign-On works your run-of-the-mill cross site scripting error on an internal resource can DEVASTATE your enterprise! I've been given the opportunity to talk about Web Security at this year's SyScan conference in Hong Kong. This is my first trip to Asia so I'm really really excited about it! I haven't traveled much outside of North America -- the trip to Chaos Camp was my first oceanic flight. The Pacific Ocean is so huge that our flight from SFO will total 17 hours! It was only 9 hours to Dusseldorf! This talk will expand on my OWASP talk on trusting the client and the MacWorld Pass hack. 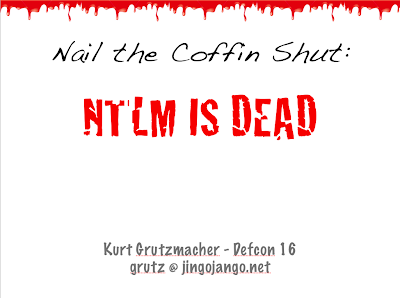 I'll also give a brief bit on NTLM Single Signon (NTLMSSP) attacks. Looking forward and will update at the con! Some have asked that because I've pick on MacWorld am I a MacHead? The answer is no, but I do like Apple products. This will be a fun movie to see as there certainly is a cult of Mac, especially here in the Bay Area. Another Free MacWorld Platinum Pass? Yes in 2008! 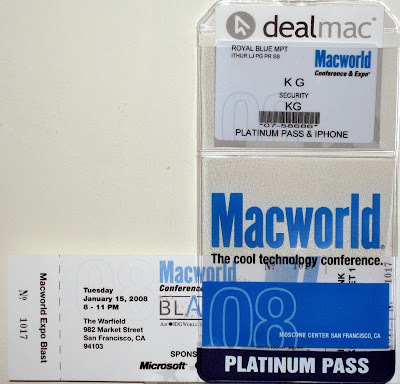 Last year at this time I disclosed an issue with the IDG/MacWorld Expo registration that allowed people Free Platinum Passes (valued at $1,695). I communicated this issue with IDG the week of MacWorld and they removed all the codes, fixed the site, and said thanks. Questions were asked on how to write better code and I gave them a few tips (don't trust user input, don't give your secret codes to everyone, encryption is not one-way, etc). Did they listen? Who wants to stand in line to see the Steve Jobs keynote at MacWorld? I mean have you SEEN the lines there? Really? 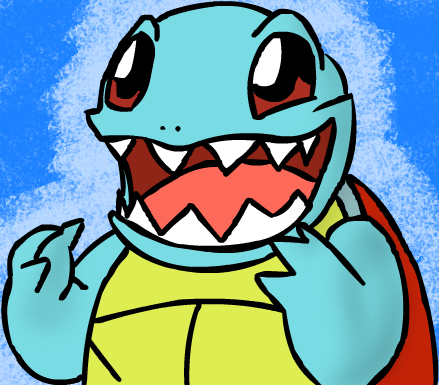 I want to know WHATS IN THE AIR(tm)!!! You can see why the cost. Last year the word "CREDIT" provided a 100% discount on checkout. These are called Application Logic Flaws and aren't new attacks but they can be devastating . Step 2. Submit your initial data and view the source of the main registration page, search for "Priority Code"
Step 5. Format the data for your cracker of choice and start cracking! I like John The Ripper for all my hash cracking needs. It's flexible, easy to use and affordable! 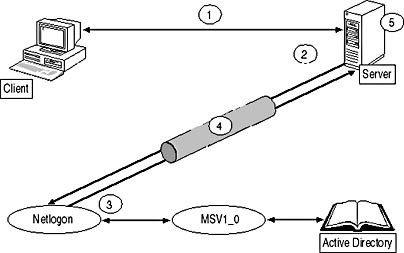 There are two main methods used to crack passwords in John, using a wordlist or incrementing through a given keyspace. I always begin with a wordlist run just to kick out the quickies. The hash for "NONE" breaks but we already know that doesn't do anything for us. Incremental mode is our next step but we know lower case letters aren't used so a quick look at the configuration file shows an external mode "Filter_LanMan" that throws everything to upper case. A quick run through doesn't net any cracked hashes unfortunately. There are still over 1,000 hashes to crack so we have to be a bit more intelligent in our cracking (or throw more machines, wait longer, get a PS3, etc). Incremental cracking can take a long time to perform. The size of your keyspace (k) and the maximum word length (l) determine the total number of permutations that have to be encrypted to check every instance (P). P=k^l. Take the benchmark cracks-per-second your machine takes (Cs), do the math (P/Cs) and you have the number of seconds it takes to run an Incremental. and so on. . . The time is cumulative and those are just my numbers. Some have found ways to increase the speed to 1 billion cracks-per-second. Until that code is released or we write our own, we have to work with clusters of machines to reach that. My little cluster of 9 nodes can do just about 60 million MD5's a second so a full 8 character run would take nearly 2 months to complete. Now that you know the math and the big mountain ahead of us, how can we get on the gondola that takes you over half of it without much effort? The answer is simple, vendor codes and keyword masking! Vendors receive a group of codes each to pass along to their customers, potential customers, friends, family, etc. These typically provide free Expo access but maybe they'll help trim down this mountain to something manageable. These free codes get passed around like candy so finding one takes a few Google searches. 08-G-PC189, 08-G-PC178, 08-G-PC260, do you see the pattern? // We know the static filter 08-?-????? .. but not too long because the first code looks REALLY interesting: 08-S-STAFF. Lets try it! Download the High Quality version. Voila. For the second year in a row, a free Platinum Pass in less than a day. Thanks to Josh Bernstein and Garrett Gee for reminding me MacWorld was coming up and independently confirming these findings.